Unitor™ Aquatuff™ can be used for different types of cleaning, and it can be applied by brush, hand spray, high- and low pressure washing machines etc. It can be applied on vertical surfaces by adding Unitor™ Foam-Agent™ (Product no. 614537) for increased resident time. Dependent on degree of contamination typical dosage is about 1-5%. Apply Unitor™ Aquatuff™ with a Unitor™ High Pressure Cleaning Machine and use 1:4 with water. However, if used with a hand sprayer, apply the product neat on the surfaces, allowing 1 litre per 12m2. Leave for about 30-45 minutes. The surface remains wet. Wash down with hot water (80°C) and check the results. Unitor™ Aquatuff™ can be used for cargo hold cleaning after soot, coal, pet coke and other bulk materials. 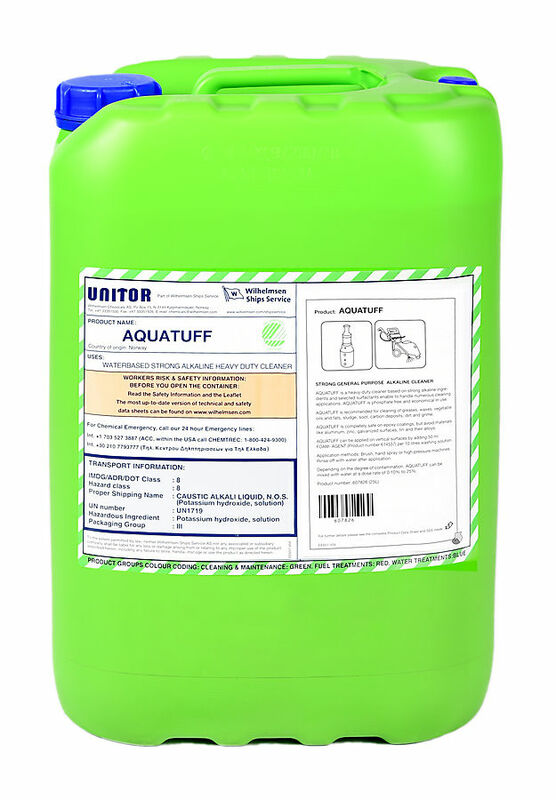 Apply Unitor™ Aquatuff™ mixed 10–25% in water, using spray foam equipment. Leave for 30–45 minutes. The surface remains wet. Wash down with a high pressure unit. For best results, direct the high pressure jet at the lowest parts of the hold first and work upwards. If Unitor™ Slip-Coat™ (Product no. 652 737015 and 652 737023) is applied to the cargo hold surfaces prior to loading, the concentration of Unitor™ Aquatuff™ in the cleaning solution may be reduced.